I've had Studio Snowpuppe on my radar ever since it was featured on the always interesting blog, Paper Runway. The crazy-chilly temps and snow (ack!) we experienced last weekend reminded me to take another look at the shop where I remembered this warm, glowing light. Studio Snowpuppe is comprised of the Netherlands-based duo, industrial designer Kenneth Veenenbos and architect Nelliana van den Baard, along with their cats June and Ayla. 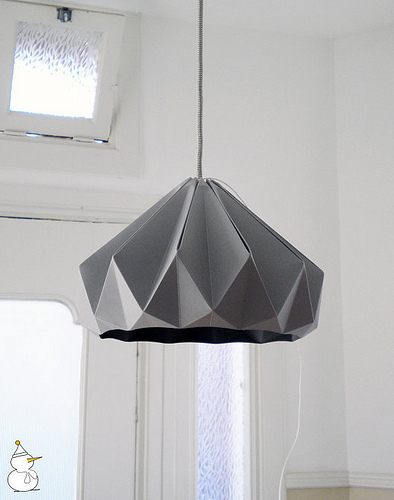 (You know to expect some fun when pets are included in the intro :)) Kenneth and Nelliana have created a series of super-stylish lampshades from paper that's folded into an attractive diamond pattern. The origami shades, cornered on the outside and round with a surprising burst of color on the inside, are available from Etsy shop, Studio Snowpuppe. There you'll also find the story of a clever Arctic snowman with a problem - how to bring warm, cozy light to dark winter days while using energy-saving lightbulbs. As you might guess, the answer involves these artistic, yet functional, lampshades. 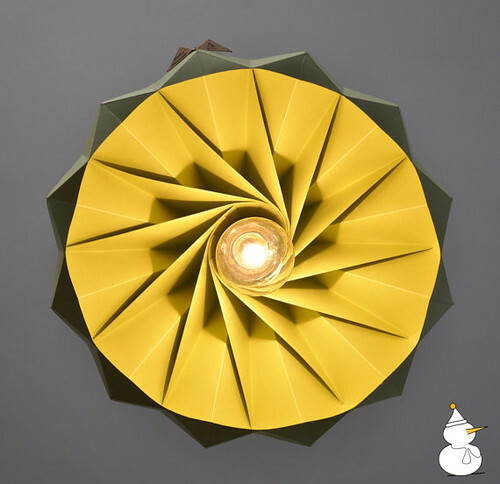 So perfectly folded paper lamps!! Really fabulous.